Gold chains and a punk rock revival are huge trends for fall. 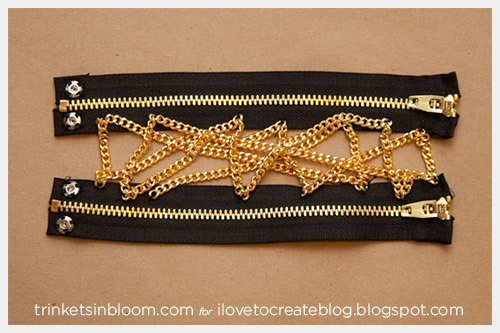 So why not add a little edge to your accessories with this DIY Zipper Bracelet with Chains. Using two zippers with the chains in between makes this a wide statement bracelet. Have fun and show your edgy side, stack it with more gold chains or wear it alone, either way you’re sure to make an impact. When you are buying your zippers make sure you get them long enough to go around your wrist with about a half inch to overlap with the snaps. I used 7 inch zippers and they were just barely the right size after folding the ends over. 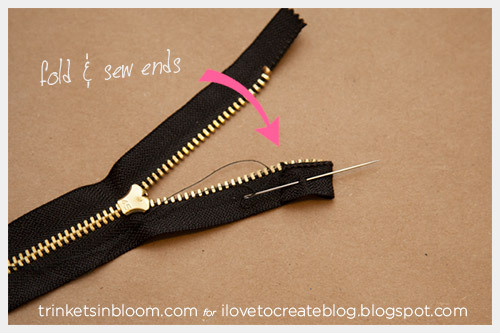 Using your needle and thread, fold over the ends of your zippers and sew them down. 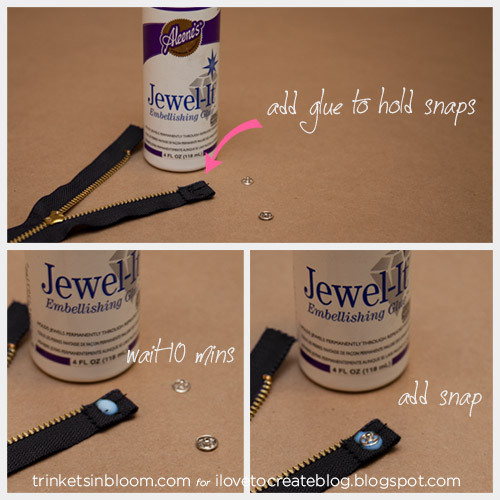 Before you sew on your snaps add a drop of Aleene's Jewel-it glue. Place a drop of glue on your zipper where you will put your snap. Because the snaps are metal it's best to wait about 10 minutes before pressing your snap into the glue. Press your snap into the glue and let it dry before sewing on your snaps. Jewel-it is one of my favorite craft supplies, when it dries it will shrink up a bit and you won't see it. So even if it squishes out around your snap, when it dries you won't see it the same. Plus this stuff holds really well (even after repeated washings, I've used it on shirts too!) I could rave about it for days but I'll spare you. Since bracelets can sometimes get caught on things, I like to add both the glue and sew it, this will ensure that your snaps will stay on. Because it you're like me no matter how much you dress up during the day you'll still end up carrying a kid, schlepping a bag or doing something that could put your jewelry at risk. Once your glue is dry, you can sew on your snaps. 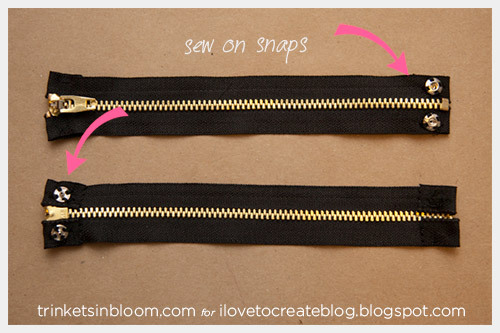 When you are sewing on your snaps make sure to sew the convex end on the underside and the concave on the outside of your zippers, so when you wrap your bracelet around your wrist you can easily close it. 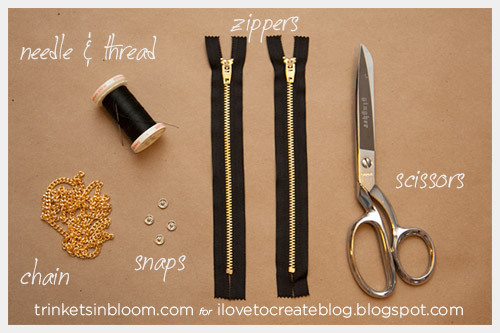 Sew one snap on each side of both ends, do this for both your zippers. 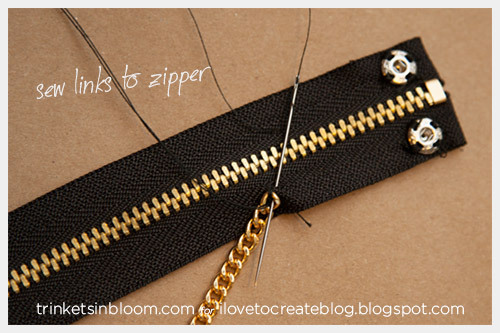 When sewing on your chain you can either cut your chain into short pieces and then sew it across between your two zippers, or keep it long and sew it as you go stretching it across between your zippers. I went with the second option mostly because my chain was a bit heavier than I expected and very difficult to open the links to cut. It was just easier to use it in one piece. 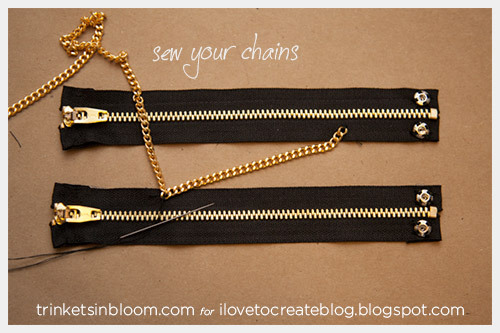 Sew your chain to your zippers and make sure you tack it securely. I sewed the chains randomly to give the look of lots of chains draped and stacked. Here you can see the side with the zipper heads and the closure. 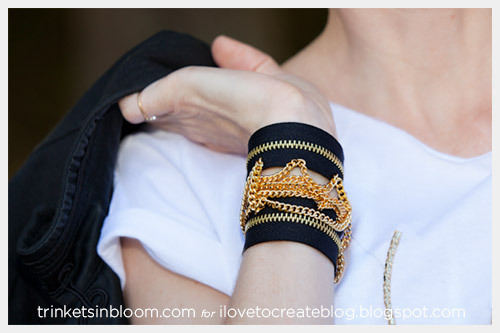 For more fashion and bracelet DIY projects be sure to check out my blog Trinkets in Bloom. OMG what a pretty bracelets. This is my first time to this site but my friend has told me about your work and you are very very good! Love this tutorial! Going to the store to try this right now. It’s such a pain to buy fashion bracelets online, I never get exactly what I'm looking for. I have a whole bunch of zippers....wow! what a great way to use leftover supplies. I was going to toss them out but now I have some inspiration for making great pieces of jewelry. Thank you!